The 60's Hippie Insta-Theme is a great way to create an entire hippie room scene for your next theme party. Our Insta-Theme starts with a Sky Backdrop and then includes different props that you can place on top. Grab the Meadow Backdrop and also the Fluffy Cloud Props to get your scene going. Add the different hippie props to complete your scene. You will need the jointed male hippie, the photo bus prop, peace sign and flower cutouts, along with the 60's yard sign. 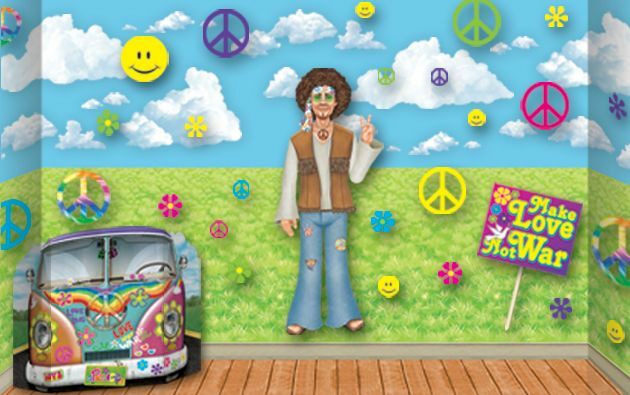 You can even use the 60's Hippie theme is a photo backdrop for a school dance or party. Have some accessories available to have a photo booth for groups of friends to take fun pictures together!